Briar Craig, associate professor in the Faculty of Creative and Critical Studies. Briar Craig, associate professor in the Faculty of Creative and Critical Studies, has been awarded second prize for his screen printing at the international exhibition Imprima 2012 -- Mostra Internacional de Gravura, in Sobral, Brazil. The exhibition runs from May 15 to August 15 at the Casa de Cultura de Sobral. Second prize includes an invitation to mount a solo exhibition of works at the House of Culture in Sobral. "My art focuses almost exclusively on screen printing, primarily photographically," says Craig. 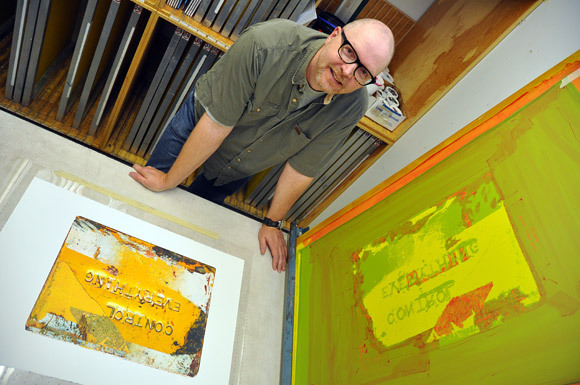 "I use digital technologies to generate stencils that I put onto screens to screen print. Screen printing is often perceived as old fashioned. My goal is to drag it into the 21st century by using photographic technologies and computers." Although Craig's work uses the latest technologies, the subject of his prints often feature aged items left behind by people. "Ninety per cent of my inspiration comes from urban man-made kinds of things -- thing we leave behind, like old eroded signs, by accident or on purpose," he says. "If they have a sense of history, that's even better." One of Craig's ambitions is to create a subjective narrative with his art. "I'm drawn to partial bits of information -- things that start telling a story but don’t complete it," he says. "My goal is not to define for the viewer what my art is about, but create opportunities for the viewer to play along and draw from their individual history, culture and understanding to figure out what the art means to them." Craig is one of 30 International artists invited to participate this November in Tribuna Graphic 2012 at the Art Museum of Cluj in Romania. Craig notes he likes to exhibit his work as widely as possible, not only to set an example for his students and encourage them to exhibit their work, but because it is the easiest way to learn what other screen printmakers around the globe are doing. "One of the biggest motivators for me to exhibit is that you receive a catalogue of the other artist's work that’s in the exhibition," he says.